[181 Pages Report] The biosimilars market is expected to reach USD 23.63 Billion by 2023 from USD 4.49 Billion in 2017, at a CAGR of 31.7%. The base year for this study is 2017 and the forecast period is 2018–2023. The key players in the biosimilars market include are Pfizer (US), Sandoz (Germany), Teva Pharmaceuticals (Israel), Amgen (US), Biocon (India), Dr. Reddy’s Laboratories (India), Celltrion (South Korea), and Samsung Biologics (South Korea). The global biosimilars market is expected to reach USD 23.63 Billion by 2023 from USD 5.95 Billion in 2018, at a CAGR of 31.7%. 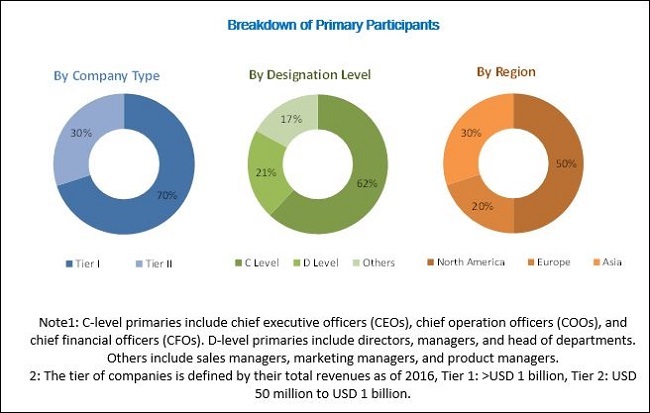 Market growth is primarily driven by the increasing demand for biosimilar drugs due to their cost-effectiveness, increasing incidences of chronic diseases, and strategic collaborations resulting in enhanced productivity and clinical trial activities. 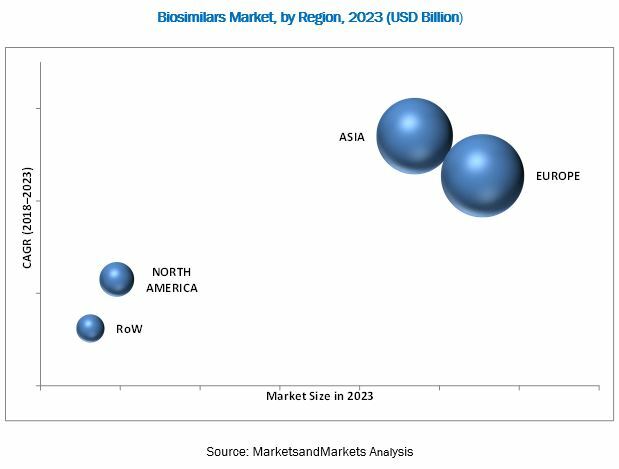 The global biosimilars market is segmented by product, type of manufacturing, disease, and region. The products in biosimilars market include non-glycosylated proteins, recombinant glycosylated proteins, and recombinant peptides. The non-glycosylated proteins segment accounted for the largest market share of the market in 2017, however recombinant glycosylated proteins are expected to hold the largest share of the market during the forecast period. On the basis of type of manufacturing, the market is classified into in-house manufacturing and contract manufacturing. The in-house manufacturing segment accounted for the largest share in 2017. Many players in the biosimilars market prefer the in-house method of manufacturing as they can develop biosimilars in their own laboratories and this type of manufacturing eliminates shipping and delivery costs. On the basis of diseases, the market is classified into oncology, chronic diseases, autoimmune diseases, blood disorders, growth hormone deficiency, infectious diseases, and other diseases. The blood disorder segment accounted for the largest share of the market in 2017. The rising incidence of blood disorders across the globe, low cost of biosimilars compared to biologics, and the rising pressure to reduce healthcare expenditure are major factors contributing to the growth of this segment. The market was dominated by Europe in 2017. Europe is also expected to hold the largest share of the global market during the forecast period. However, Asia is expected to witness the highest CAGR from 2018 to 2023. A number of factors, such as the patent expiry of biologic products & the launch of new biosimilars, rising incidence of chronic disorders, and the emergence of new market participants are expected to propel market growth in the region. Growth in the geriatric population and the subsequent increase in the incidence of age-related disorders and chronic disorders is also expected to increase the demand for biosimilars in Europe. Pfizer (US), Sandoz International (Germany), Teva Pharmaceuticals (Israel), Amgen (US), Biocon (India), Dr. Reddy’s Laboratories (India), Celltrion (South Korea), and Samsung Biologics (South Korea) are some of the key players in the global biosimilars market. *Details on Marketsandmarkets View, Introduction, Product & Services, Strategy, & Analyst Insights, New Developments Might Not Be Captured in Case of Unlisted Companies.